Every day we are surrounded and influenced by Rhythm and Colour. Both are created by design either by man or nature making one no less important than the other. Be it repetitive in nature such as the perfectly shaped petals of a dahlia or the precisely placed telephone poles along a road; each ultimately representing a visual rhythm. As for colour, nothing in this world is free from its influence. It can either be lacking or be totally engulfed by a myriad of awe inspiring hues. This beauty that we are fortunate enough to experience is the inspiration for this exhibition, showcasing the elements of Rhythm & Colour. 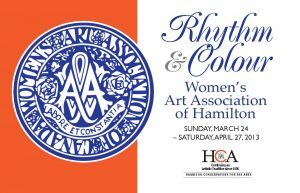 The Women’s Art Association of Hamilton (Est. 1894) is a collective of talented women artists and art enthusiasts with a goal to promote appreciation of the visual arts among its members and within the community.